I'm surprised by the price differential in these times, especially seeing that the performance differential is so marginal. Excellent review Hexus. The under-load power-draw figure seems counter-intuitive at first glance. A slower chip with less cache shouldn't pull more juice than the Core i7 3960X. This graph summarises the inherent danger in testing engineering-sample chips provided by Intel, meaning CPUs have a range of operating voltages that differ from processor to processor. Looking into it further, the 3930K ES chip's default operating voltage is a smidge higher than the also-ES 3960X on the ASUS Sabertooth X79 board, helping explain the above graph. Whatever the case, both Intel and AMD specify a range of voltages for retail parts, and a same-stepping Core i7 3930X is likely to draw similar power to the other SNB-E chip.. The X chips are going to be the very best of the bins, with the least leakage etc so even with a step in speed might require less voltage. But as you note, voltages vary between chips as well. (And you mean 3930K, not X, in the last sentence quoted, from page 6 ). In the end, that's a lot of chip for the money, comparable to previous mid-range 1366 chips. Certainly makes the old 980X out-dated. I would have preferred a slightly tweaked 1155 SB chip with SMP support and a new chipset instead. Looks like it would have been considerably cheaper and better performance/watt too. That's kind of what this is. SMP support requires additional pins, so if you're changing socket you can fit in a few more server oriented features at the same time. In the best case scenario the £450+ Core i7 3930K is around 50% faster than a £240 Core i7 2600K in synthetic benchmarks. On top of this the cheapest socket 2011 motherboard I have seen ATM is around £180. However,with actual applications even the slightly faster Core i7 3960X is at best around 34% faster than a Core i7 2600K. Is it possible that Hexus could compare an overclocked Core i7 2600K or Core i7 2700K against the Core i7 3960X at stock and when overclocked?? It will be interesting to see how well the cheaper socket 1155 CPUs compare when overclocked and on top of this how much power they consume. 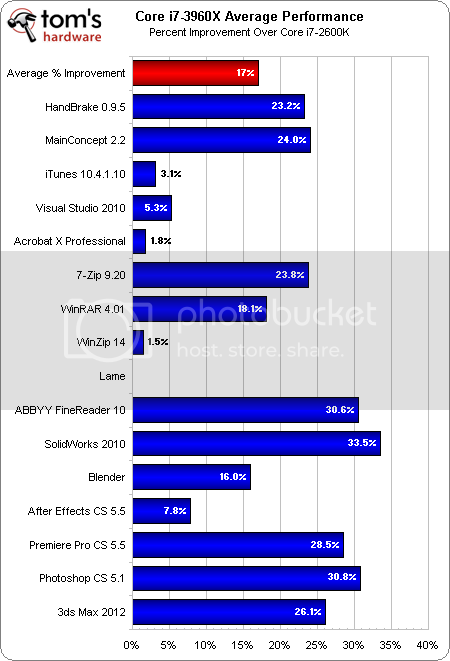 Overclocked socket Core i7 power consumption figures might even be comparable to the socket 2011 Core i7 CPUs at stock. Last edited by CAT-THE-FIFTH; 16-11-2011 at 01:14 PM. There was absolutely no need to double the pin count for SMP....hell socket 775 slimmed down to 771 for SMP and previous generations used the same socket. The extra pins are predominately for the extra cores. Haswell has 1150 pins which is less than the two previous generations. Is it so hard for Intel not to keep to socket 1155?? Even AsRock showed that the current chipsets work fine with socket 1156 CPUs. Considering that the main improvement of Sandy Bridge over Lynnfield was uncore improvements they probably could have kept the same socket even for Sandy Bridge. Even AMD is now doing this as FM2 has only one less pin than FM1! And the same communication pathway, which was why they were rubbish at SMP. I agree they didn't need to go as high as 2011 if you want SMP with a small number of cores/memory channels per chip, but how popular is that scenario? In most cases the reasons for SMP are to get additional processing cores or more memory amount or bandwidth - both of those are better served with a larger single chip that has more internal cores and more memory channels. TDP is usually the limiting factor, and that's the same for these chips as it was for 1366 skt chips. Westmere EX has 8 cores and yet uses 1567 pins. Yup, gimme a few hours - doing some admin work atm - and I'll update. Would love to see how a Core i7 2600K (at stock & OC'd to 4GHz, 4.5GHz) compares to the Core i7 3930K. Is it possible that Hexus could compare an overclocked Core i7 2600K or Core i7 2700K against the Core i7 3960X at stock and when overclocked?? Yup, got a Core i7 2700K on the testbench. Will include a full set of overclocked numbers so that you can compare how it fares alongside 3930K. Is it possible to get power consumption figures too for both CPUs?? Thanks for the review Tarinder, good job. I've been waiting for definitive numbers on the non-extreme chip. Another topic of interest, perhaps not for this article, is the power consumption variance between different different motherboards/manufacturers. I've been reading that Intel and MSI (purportedly using Intel's spec) branded motherboards are demonstrating a lower idle power consumption especially. I'm not sure if this is due to a different power management or just more doohickeys onboard (for other brands).